Whenever I venture into the city, I always keep my eye out for places selling soft pretzels. They are a novelty to me! A delicious novelty. In Australia it's hard to find anywhere that sells them and especially not around here. 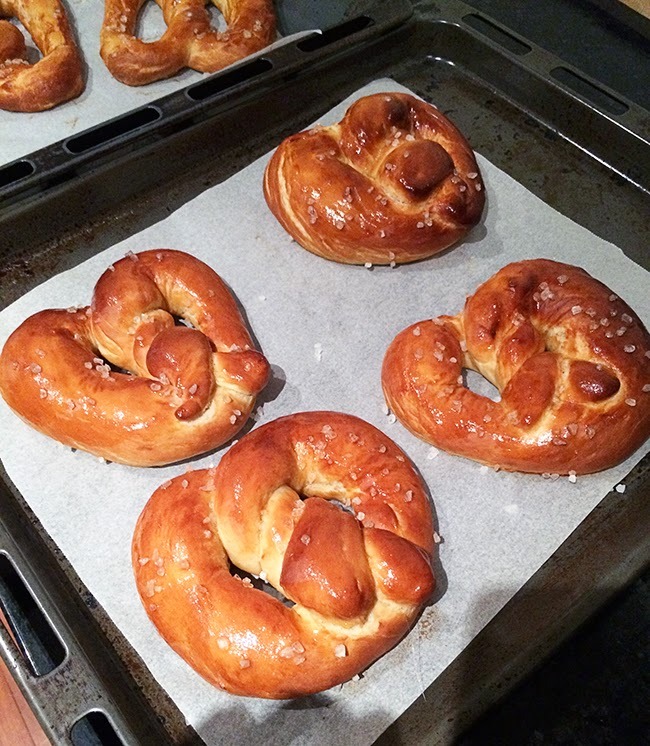 So I ventured out to find a recipe that would let me make my very own scrumptious soft pretzels. The same amount of yumminess that I would find if I purchased a fresh one from the store. And boy oh boy did I find it. This recipe is from Auntie Anne herself! (I don't actually know what this is, but google says it's a pretzel place!) Awesome! These turned out fantastically though. I can't wait to make them again, but also not as I devoured almost every pretzel myself. Which I only feel slightly guilty about. Warm milk in a microwave safe bowl in microwave until temperature of milk reaches 110 degrees, about 1 1/2 - 2 minutes on HIGH power. Pour milk along with yeast into the bowl of an electric stand mixer and whisk together until yeast has dissolved, let rest 5 minutes. Add brown sugar, 4 tbsp softened butter, 1 cup flour and 2 tsp fine sea salt to milk mixture and using the whisk attachment, stir until blended. Switch attachment to a dough hook, add remaining 3 1/2 cups flour and knead mixture on medium low speed until elastic. Mix in up to an additional 1/2 cup flour, as needed, until dough pulls away from the sides of the bowl. Cover bowl with plastic wrap and allow dough to rise in warm place until doubled in size, about 1 hour. Preheat oven to 230 degrees Celsius (350F). Punch dough down several times to release any air pockets. Divide dough into 12 equal pieces (the easiest way to do this is to divide the dough in half, then divide the halves into halves then those and into thirds). Grab each individual section and roll each piece out into a long, thin rope about 32 - 36 inches long. Form dough rope into a pretzel shape. In a shallow bowl, whisk together baking soda and warm water then fully immerse pretzel into water mixture and allow excess water to drip off. Place on prepared baking sheet, reshape as needed and sprinkle to taste with coarse salt. I went a little overboard on my salt and had to pick some off, so go easy! Repeat this process with remaining dough. Bake pretzels in preheated oven 7 - 11 minutes until golden brown. Remove from oven and brush top and bottom of pretzels with melted butter. Serve warm. Reheat in microwave to snack on once they've cooled, if desired. THESE VIDEOS RIGHT HERE! Trust me, it basically has a video for every step of the recipe, and the most important part, SHAPING THE PRETZEL. Which I had no idea how to do. If you're watching the shape it video, don't worry, the guy shows you the difficult way like 5 times and then right at the end, he goes Oh also this way. It's heaps easier.